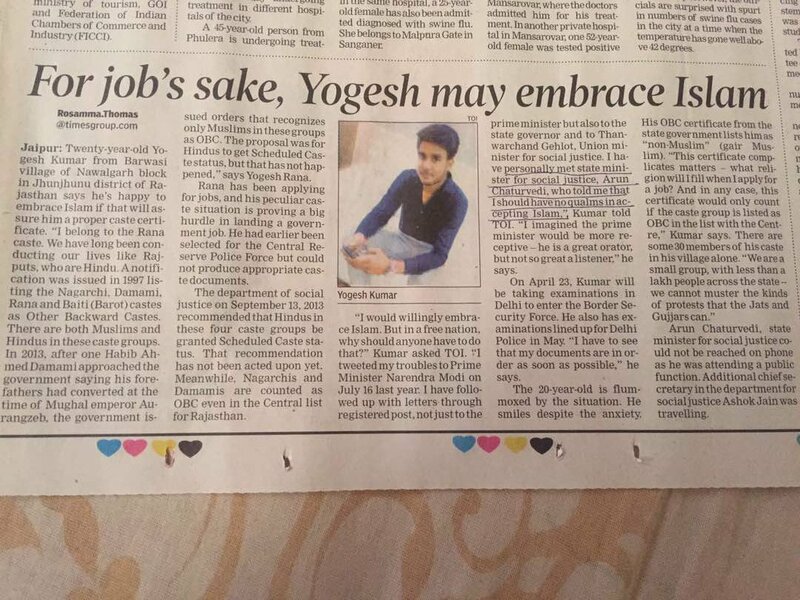 Exasperated from his current situation, Yogesh Kumar’s helplessness has tempted him to convert to Islam if that could assure him a proper caste certificate. “I belong to the Rana caste. A notification was issued in 1997 listing the Nagarchi, Damami, Rana and Baiti (Barot) castes as Other Backward Castes. There are both Muslims and Hindus in these caste groups. In 2013, after one Habib Ahmed Damami approached the government saying his forefathers had converted at the time of Mughal emperor Aurangzeb, the government issued orders that recognizes only Muslims in these groups as OBC. The proposal was for Hindus to get Scheduled Caste status, but that has not happened”, these are the words of Yogesh Kumar Rana, a young (20) resident of Barwasi village of Nawalgarh block in Jhunjhunu district of Rajasthan who has been applying for governmnent jobs lately. If unemployment alone was not a big problem in itself, his peculiar caste situation is proving a big hurdle in his selection for the jobs. Even 10 months back, Yogesh had been selected for the Central Reserve Police Force but could not produce appropriate caste documents. Before 2013, the Hindus of Rana, Nagarchi, Damami, and Baiti (Barot) caste got reservation under the OBC category but Muslims were not covered. In 2013, less than 2 months before the assembly elections, the then Congress government changed the rule and made OBC reservations for these 4 caste group exclusive to Muslims, with a proposal to provide the Hindus reservation under SC category. The recommendations of the department of social justice dated September 13, 2013 ordering Hindus in these caste groups be granted Scheduled Caste status have not been circulated yet in the districts. However, Nagarchis and Damamis are still counted as OBC in the Central list for Rajasthan. As per this report from last July, Minister of social justice in the present BJP Govenrment, Dr. Arun Chaturvedi, had said, “The notification to include these castes was released a long time ago. It shouldn’t be a problem for anyone in getting a caste certificate made”. But the Nawalgarh sub-divisional magistrate, Bhagirath Shakh, said, “We haven’t received any official order or clarification. Once an official order is received, we can prepare the caste certificates giving reservation”. It has been over 3 years since the recommendation by Rajasthan social justice department to include Hindus from these 4 castes in SC category was issued. But people like Yoesh Kumar Rana, who in all likelihood were behind the sweeping BJP victory in Rajasthan 2013 assembly elections, are still running from pillar to post to get their due. “I tweeted my troubles to Prime Minister Narendra Modi on July 16 last year. I have followed up with letters through registered post, not just to the prime minister but also to the state governor and to Thanwarchand Gehlot, Union minister for social justice. I imagined the prime minister would be more receptive – he is a great orator, but not so great a listener.” says Kumar. “I have personally met state minister for social justice, Arun Chaturvedi, who told me that I should have no qualms in accepting Islam,” a disappointed Kumar told TOI. If a politician of as big stature as that of a state minister has actually said something as ignominious as this, this is a matter of great concern. Ministers are there to serve the people. Such irresponsible and flimsy behaviour is to be severely condemned. On April 23, Kumar will be taking examinations in Delhi to enter the Border Security Force. He also has examinations lined up for Delhi Police in May. “I have to see that my documents are in order as soon as possible,” he says. The 20-year-old is flummoxed by the situation. He smiles despite the anxiety. His OBC certificate from the state government lists him as “non-Muslim” (gair Muslim). “This certificate complicates matters – what religion will I fill when I apply for a job? And in any case, this certificate would only count if the caste group is listed as OBC in the list with the Centre,” Kumar says. As per TOI, Arun Chaturvedi, state minister for social justice could not be reached on phone as he was attending a public function. Additional chief secretary in the department for social justice Ashok Jain was travelling. “I would willingly embrace Islam. But in a free nation, why should anyone have to do that,” Kumar asks. Congress, especially the current Sonia led avatar, has done incalculable damage to the nation and the ideology it now represents is clearly anti-Bharat and anti-Dharma. Minority appeasement has been taken to never-before seen levels by Congress and the same is being emulated by other secular clones like TMC, SP, RJD, TRS etc. The act of removing Hindus of Yogesh’s caste from OBC category and reserving that benefit solely for Muslims is exactly the type of pre-election sop that one now expects from the Congress ecosystem. The Congress ecosystem cares two hoots for Constitutional norms or consensus-based policy making. They only worship power and the attendant perks it carries. Sonia, in particular, enjoys hurting Hindu interests and planting seeds of discord in our society. The way UPA pushed through 93rd Constitutional amendment paving way for the sectarian anti-Hindu RTE, sectarian purses such as the MSDP were introduced, extra-constitutional bodies like NAC, NCPCR, NGT etc were created, draconian anti-Hindu laws like Communal Violence Bill (CVB) were contemplated – shows that the Constitution is just a piece of paper for Congress and its Lutyens’ lawyer/intellectual army of Sibal, Singhvi, Mander etc. Influential sections of BJP just don’t have the passion & foresight to overturn the injustice meted out to Hindus over 70 years of ‘secular’, Nehruvian rule. They lack the vision and fight needed to outsmart the entrenched Nehruvian establishment which is still calling the shots in judiciary, academia, bureaucracy. If Rajasthan social justice minister Arun Chaturvedi has indeed told Yogesh that ‘he should have no qualms in accepting Islam’, the minister should be dismissed and expelled from the party. But when high-powered central ministers like Shri Arun Jaitley regularly hobnob with discredited anti-Hindutva Lutyens’ hacks and launch their books, the rank & file of the party get a chalta hai (anything goes) message. BJP shouldn’t expect party workers to shed blood while taking on murderous ‘secular’/communist ruling parties in West Bengal and Kerala, if their senior leaders can’t even show token acknowledgement of Hindu angst. Many rootless, urban Hindus buy the left-liberal theory that Muslims are oppressed and marginalized in Bharat. 99% of these latte-sipping, Premier League watching, spiritual/agnostic Hindus (in name only) will be clueless that Muslims are included in OBC reservation category of many states, like in this case from Rajasthan. Yet, the CM of Telangana is hell bent on giving 12% exclusive reservation for all Muslims of his state. The truth is that Muslims are one of the most organized and politically powerful communities in the country. The way in which Muslims of Yogesh Rana’s caste have managed to garner OBC reservations for themselves, shows how savvy Muslims are at playing the secular political game. If Muslims lag on education and other human development indices, it is chiefly because they prefer to keep themselves insulated in order not to lose their Islamic identity. For them, religion comes above all else. The clock is ticking for Hindus. Electing BJP to power in states and at the centre is just the first step. To force BJP to safeguard Hindu interests and bring about the fundamental changes to Constitution, education, State and social structures that are needed to promote Hindu civilizational interests in the long-term, requires changing the Hindu mindset and non-political organizational work at the grassroots.